Heavy grade, 100% linen canvas is used for all work on canvas. The sides of the canvas are painted, so framing is not required. Nails are used on the sides to hold the canvas in place, and these are painted also. 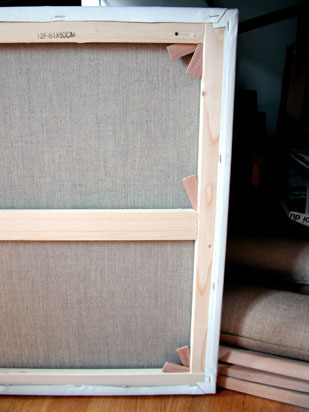 Staples are used on the back of the canvas to provide extra support, and to keep the edges against the wood. Works on paper are done on antique paper from rare or out of print books, or on handmade, 100% cotton, acid and chlorine free artist's archival quality paper. Extra-fine oil paints are used for work in oil, including Blockx and Williamsburg (handmade, stone ground oil paints), and Sennelier and Mussini oil paints. 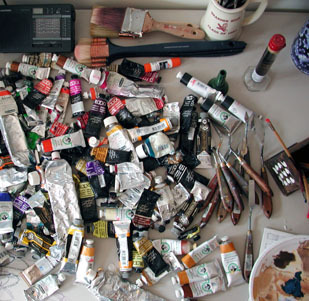 Golden, extra-fine acrylic paints are used for all work in acrylic.